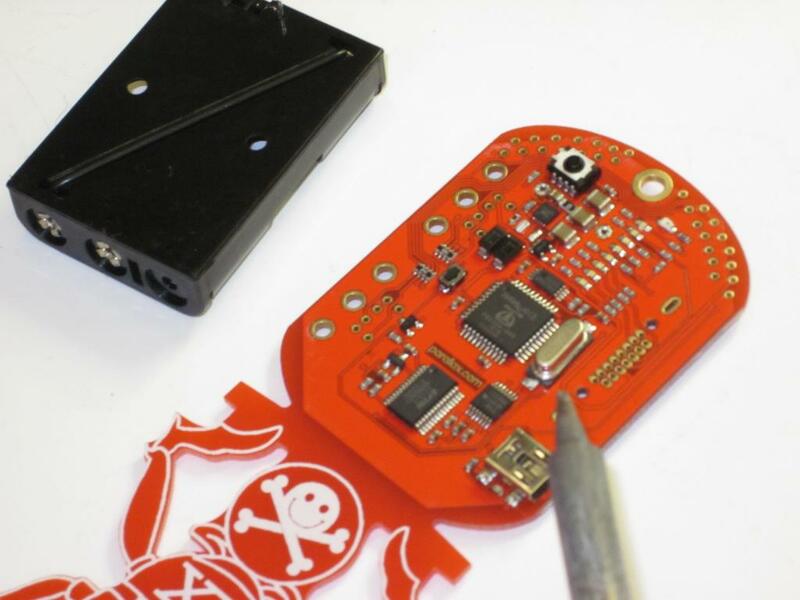 The DEFCON 20 Badge was designed and manufactured for the largest continuously running hacker and computer security convention in the world www.defcon.org. This year's DEFCON is a four-day technical session held at the Rio Hotel in Las Vegas, founded and run by Jeff Moss (DarkTangent). Ryan Clarke (LostboY) designed this year’s badge as a core part of the hacking contest. Jon Williams authored the core code objects. 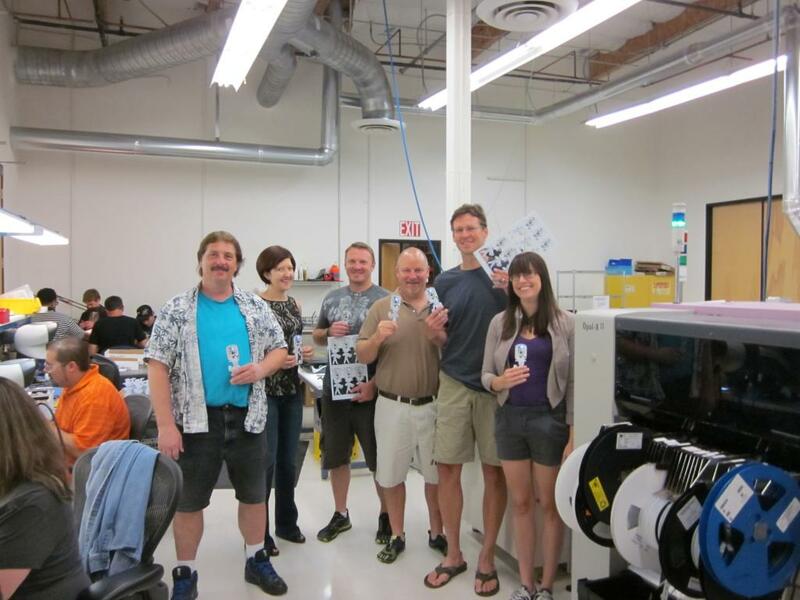 Parallax manufactured 16,500 units in our Rocklin, California facility through June and July. The badge is based around the Propeller P8X32A 32-bit multicore processor. 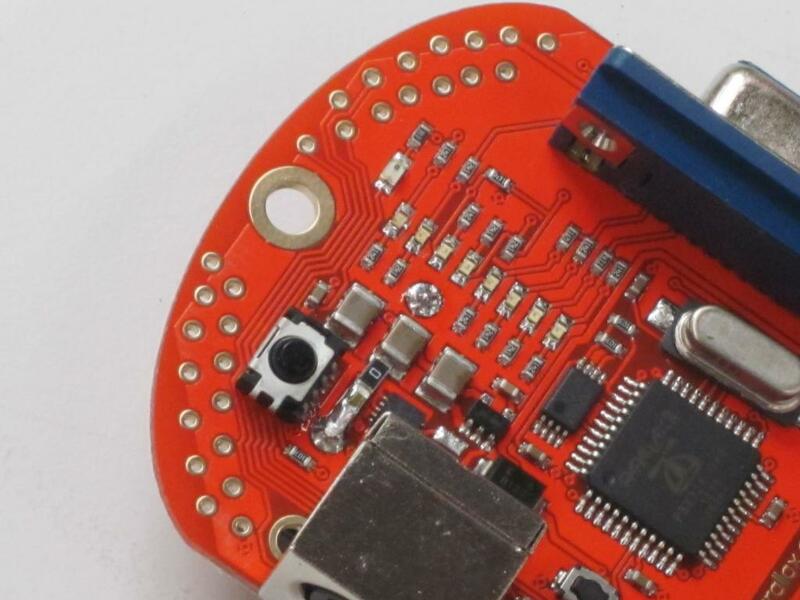 The badge features an infrared LED and receiver for badge-to-badge communication, a bank of eight LEDs for visual feedback and a USB circuit for data access and programming. Each attendee receives two PS2 adapters and a VGA connector so they can stop by DEFCON’s Hardware Hacking Village to turn their badge into a small computer system. Three AAA batteries can power the badge for the entire convention. The badge types were produced in eight color schemes for different types of attendees: ARTIST, CONTEST, GOON, HUMAN, PRESS, VENDOR, UBER, and SPEAKER. The HUMAN badge was produced in 21 different shapes, for 21 unique badge styles. Yes, it was a complex design process. At the DEFCON opening ceremony attendees will receive key information about how the badge is used to solve the challenge. We really don’t know much about the Badge Challenge, but it’s really clear that people need to mingle to unlock some cryptology clues. Take a walk around, connect your badge to Parallax Serial Terminal at 57,600 BPS to see who’ve you encountered. Everybody has access to the Propeller objects used in the top-level firmware. They're available for download below. So you’ve picked up a DEF CON 20 Badge and you’d like to start programming it for another purpose. These forums are among the most valuable of all of our resources. Take a look and download some of these before you get started. 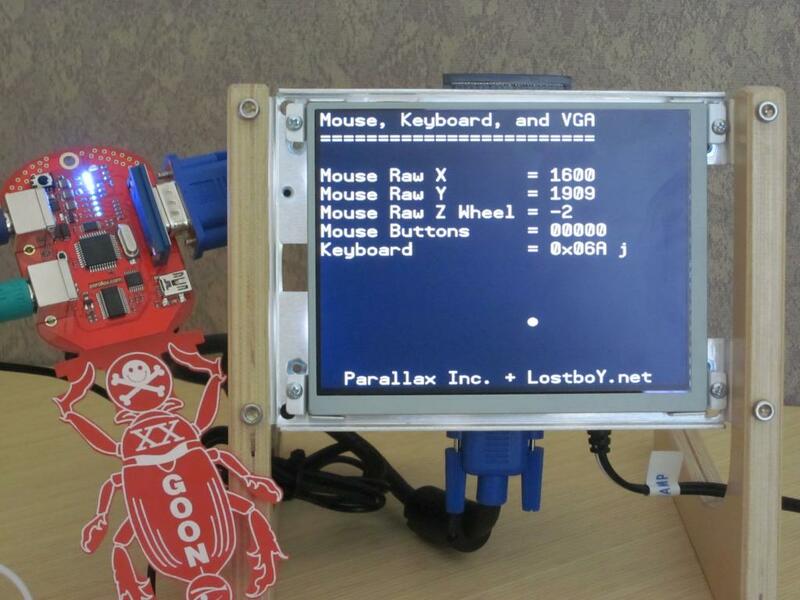 Parallax was sworn to secrecy about everything we knew about the DEFCON 20 Badge. The DEFCON organizers are a classy group of people and they needn’t share more than they must. Imagine what it’s like working with a customer who seems to have no address or name, who makes a quick verbal agreement over a steak in Washington D.C., and where trust is your only insurance policy. Parallax had invested a portion of our company in Ryan Clarke’s vision so it seemed appropriate to interview him about the badge design. I called Ryan via Skype a few days before DEF CON to get an interview. Ken: Where does the DEFCON 20 Badge fit in the conference? Ryan: First I’ve got to tell you a bit about hacking and the goals of the contest around the badge. Today so much fun is taken out of solving a mystery – younger people expect to find answers on Google but when it comes to the DEFCON badge contest almost everybody wonders, “what’s the goal?” Attendees will never know what they’re up against. It’s all about having intellectual curiosity – identifying what’s normal, abnormal, and what the little hooks of information mean. There’s social engineering, hardware hacking, programming, and several paths to the solution. The kinds of skills teams need to win the badge challenge include electronic engineering, linguistics, mathematics, pop culture, physical security, and a mindset that drives them to get answers. What is the implied meaning of what you’ve seen and what is it leading me to? This kind of challenge brings magic back into the world – you can’t get the answers off of Google. The kinds of people who solve a badge challenge fit the MIT definition of a hacker. Take a look at it. Ken: What do you expect from a participation standpoint? Ryan: Lots of it. You can’t win the badge contest unless you participate. We’re all a bit nerdy so this will force us to interact with one another. Ken: How do the badges interact with one another? What will people do with the badges? Ryan: You’ve made over 20 variants of the Human badge and more than seven other versions (Press, Uber, Goon, Vendor, Speaker, Artist, Contest). These badges communicate over infrared – connect your badge to a serial terminal and it’ll tell you who you’ve encountered. Cryptology can be unlocked along the way. The ancient hieroglyphic shapes, binary codes and firmware provide key bits of information - notice how the vendor and speaker badges face one another as one provides knowledge and the other one takes your money. 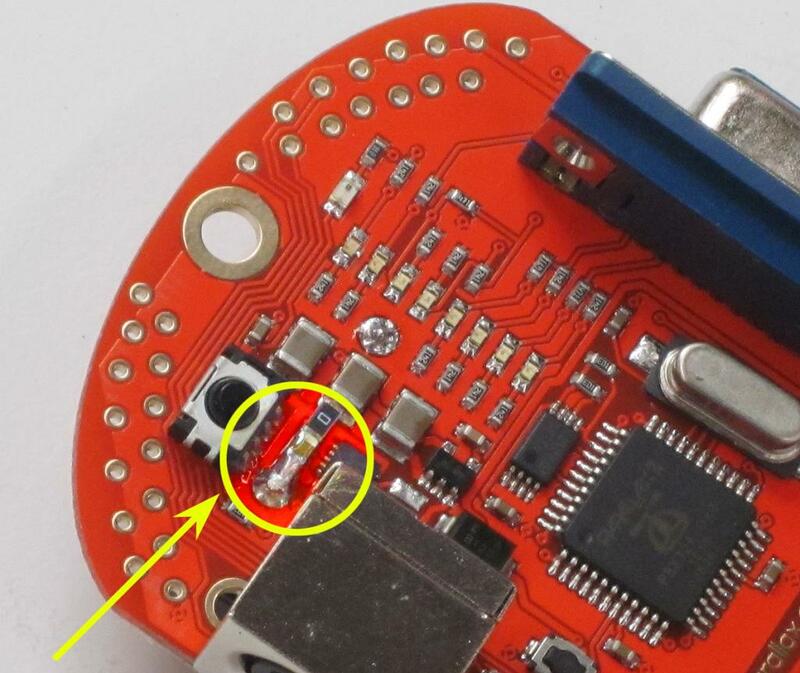 People will start out dumping EEPROM contents and seeing strings in memory, compare them to running strings to extract themes, and some will even fuzz the board. The badges have unique firmware. People who want to reprogram them could experiment by loading RAM only since the Propeller code resides in EEPROM, or they can reload EEPROM. 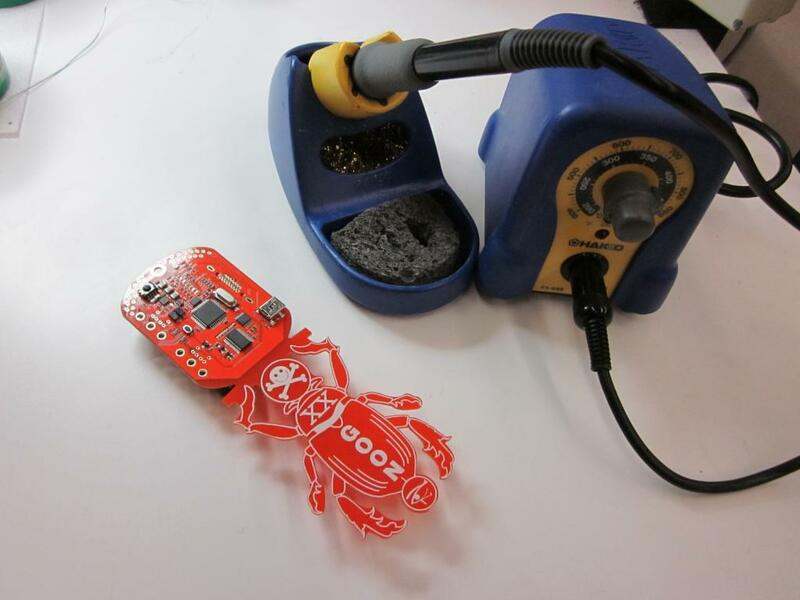 Reprogramming the badge could still allow somebody to win the contest with a hacked badge. They can go to the Hardware Hacking Village and add the VGA/PS2 ports and turn it into a small computer. Badge contest tips can propagate in a matter of minutes. Check my Twitter feed – as clues are unlocked we’ll help people along. Ken: And if somebody wins the badge contest? Ryan: They receive an Uber badge which gives them free DEFCON admission the rest of their life. If a team wins only one person gets the Uber badge. Free admission is only a side benefit – being recognized as a “black badge holder” provides big status in this community. Ken: How much time have you put into the badge planning? Ryan: At least 500 to 1,000 hours, starting last year, but it’s hard to differentiate it from all of my DEF CON tasks. I’m also running the Mystery Challenge as a follow-up to last year’s contest. I really love working with the DEF CON crowd and it’s a true passion of mine. Ken: Wow! 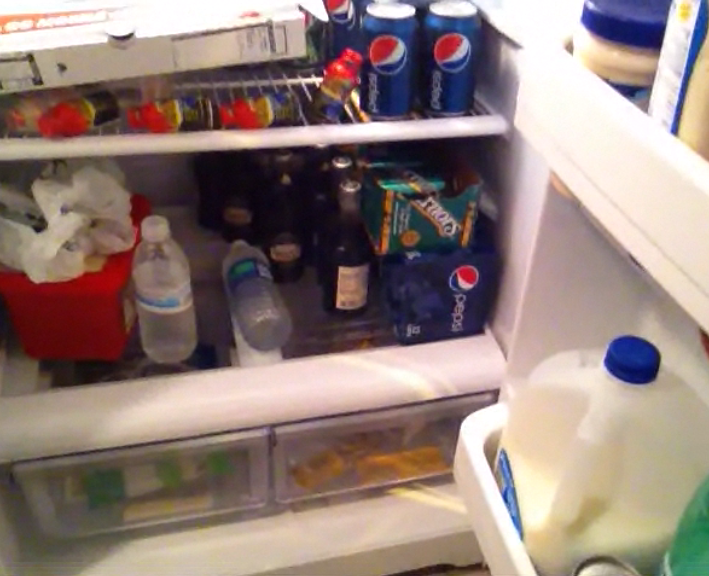 I’d really like to see what’s in your refrigerator so I can understand how you have so much energy – can you show me? Ryan: Sure, it’s right here. I have 5-Hour Energy, pizza and soft drinks. 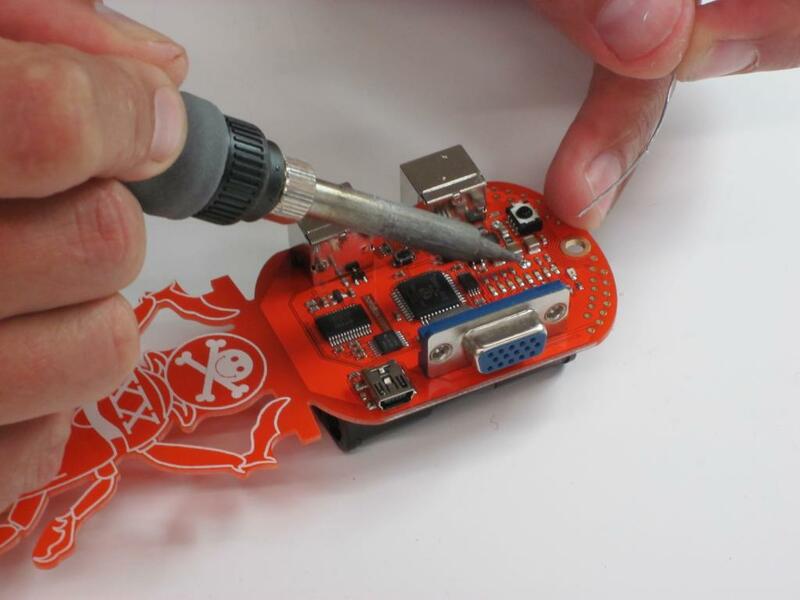 The DEF CON 20 Badge can be programmed like a small computer. The Propeller has eight cores and a video generator so it can easily interface with VGA and PS2 ports. Here is how you can install the two PS2 adapters and VGA connector. 1. 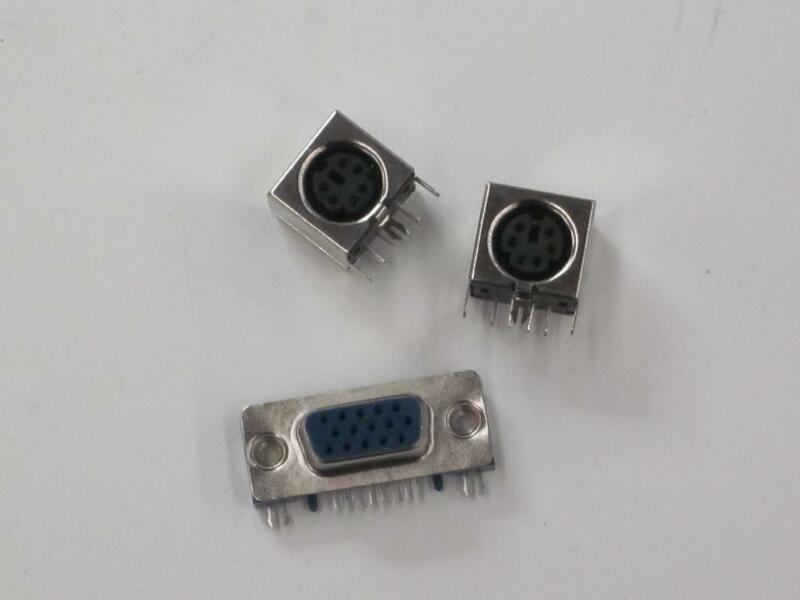 Collect the two PS2 adapters and VGA connector. 2. 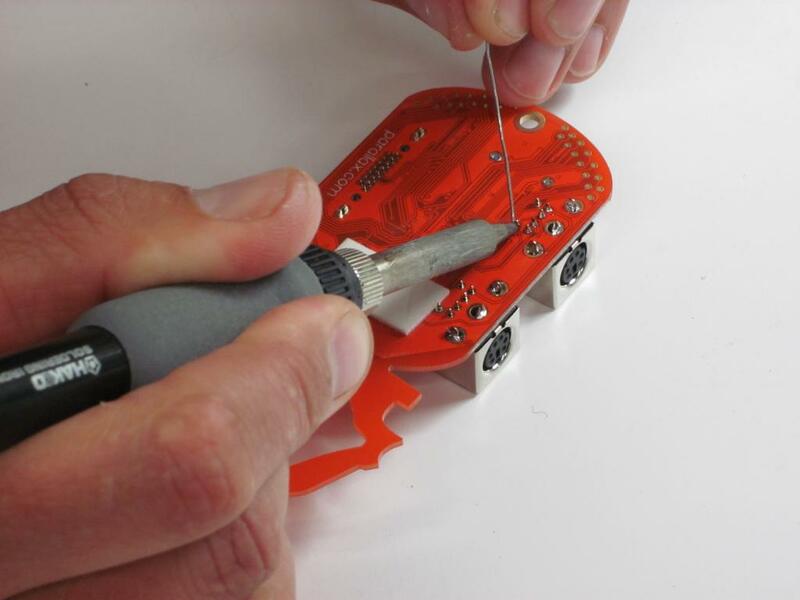 Get out your soldering iron. 3. Heat up the battery pack’s leads from the front of the badge PCB and “walk” it out one side at a time. 4. Set the battery pack aside. 5. Put in the two PS2 adapters and VGA connectors, soldering them in place. 6. Put the battery pack back on and solder it in place. 7. Add back the solder bridge from the battery pack’s positive terminal to the adjacent capacitor. Apply solder paste through stencil with squeegee. Visual inspection of any fussy parts. Visual inspection for any fussy parts. Battery test and electronic test. Ordering the same component (a regulator) from four different sources, some of which included component brokers. Lead time for a single prototype only, and then we went straight to production boards. Rework. 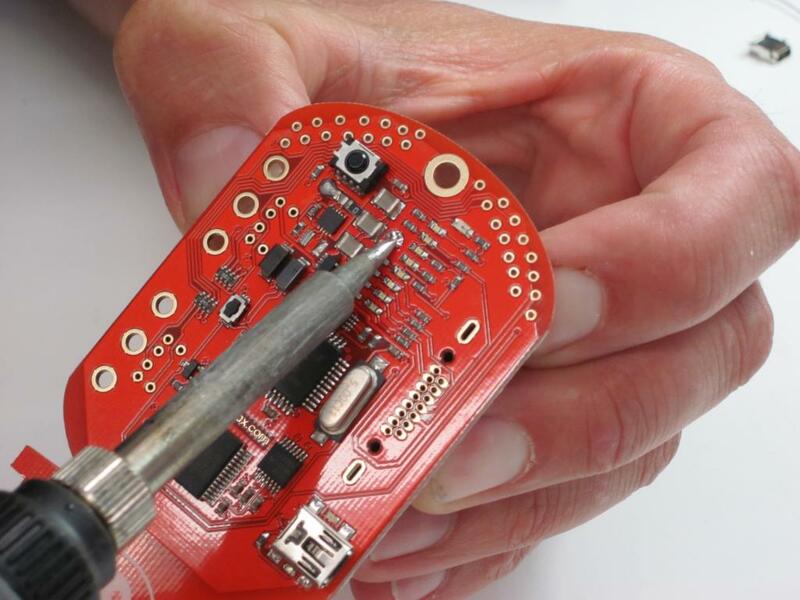 Easy failure modes include bad LEDs or voltage regulator that didnt reflow (easy replacement). More complex rework might include replacing an EEPROM or voltage regulator. As DEF CON newbies we heard some interesting things about this convention - don’t put your computer on WiFi, that the ATM in the lobby may not be from your bank, and that your credit cards should be left at home. Who would want to go to such a place? We do! None of us had been to DEF CON and we wanted to see the presentations, to help modify the badges, and of course to fly quadcopters. It’s a rare opportunity for our team to go to a convention and not be an exhibitor, and wander around like anonymous people. So we gathered for a pre-DEFCON photo. Thomas, our PCB Layout Engineer for the DEFCON 20 Badge, and the guy who will drive a 16’ truck to Las Vegas. Emily, our Marketing Assistant who so deftly handled our logistics and planning. Nick, Tech Support Engineer and all-around technical expert. Jim, Sales Manager who sees opportunities none of us would have caught. Myself, nervous most of the time without this and going to DEFCON to catch up on sleep. Jessica, Engineering Manager and our DEFCON 20 Badge leader. But wait - we have yet another Parallax DEF CON participant: Chuck Gracey, aged 76. 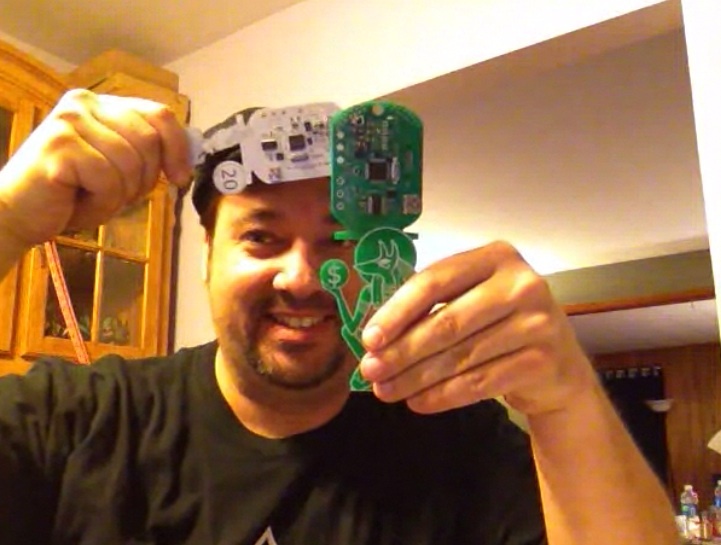 A few days before DEF CON I was showing Chuck how the badges interact. Being a Propeller programmer, he just couldn't resist the lure of the 'CON to see the badges being hacked as intended. 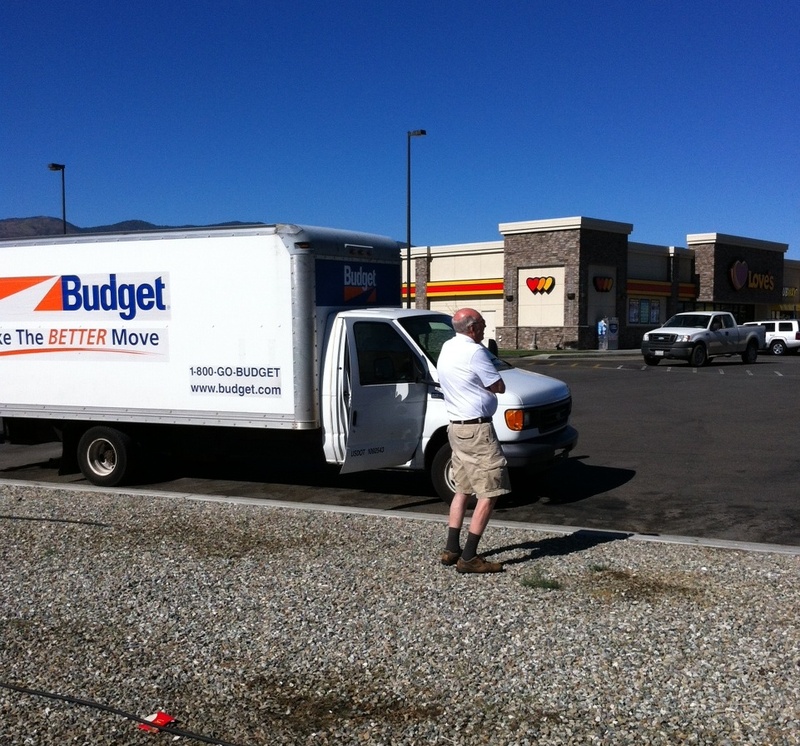 With no hotel reservation and no return airline ticket, Chuck boarded Thomas' Budget rental truck at 3:00 am to drive to Las Vegas. Do we need to be concerned? Not at all! Chuck has been to hundreds of conventions around embedded design, aerospace, and robotics. He's a world traveller and gets around with confidence, even in 110F heat of Las Vegas. But could he protect his iPhone? Below Thomas captures a photo of Chuck with our truck somewhere south of Tehachapi, California in the high desert. DEF CON 20? Are we defining 20 constants, or is there a particularly low defense readiness condition today? Oh, you must mean the 20th annual DEFCON hacker's conference currently in Las Vegas! That's the Con he's referring to. And DEF CON, DEFCON and Defcon are all accepted spellings. DC20 is also good. That is awesome you guys! Congrats on getting the manufacturing gig and having the Propeller included. I can see the "Uber" that's not on the Wired page. Now we just need Joe Grand to do another next year with the Propeller 2, that will be available...when? Ken, you should wear steel toed sandals around the PNP machine. Imagine the pain if a 0602 resistor fell off of one of those reels. Thanks for the write up. I've always wanted to attend one of those events. Anyone here go? Do tell! This is awesome stuff. GO PARALLAX! I think all forum members should be given one. Please, Please!! Are you planning to sell those badges on parallax store? Are you looking for a professional PCB/Schematichs software? Sell? No, we have earned them! Great write up, fun to know about the badges. I overwrote the firmware on the badge, and I'm not sure how to reset it. What code do I need to push to the badge to put it back to the way it came? That's part of why our whole team has been so quiet. We've had an amazingly, overwhelmingly, awesome time doing this, plus trying to keep up with *regular* product stock levels. Our Production Crew was/is amazing! They worked two shifts everyday for weeks, to make sure we didn't let *regular* inventory levels drop precipitously. Just about everyone here was involved in some aspect whilst it was going on - and we had to keep it all TOP SECRET. "Kitting" has been going on for weeks...imagine bagging 100,000 "AAA" batteries by hand?! "Everybody Else" was involved at some level - without the Entire Team, it would/could not have happened. And it's all done right here, in the Good-ol'-USA !!! From reading Ken's first post, full code won't be released till the conference is over. You could try some social engineering on one of the event organizers? I'm sure someone has a copy of the code they can upload for you. Another option would be to copy the EEPROM from another attendee's badge. The simplest way for me would be to grab 2 wires to link the boards, load two copies of the i2c_basics.spin from the Badge objects archive, and write a copy loop. There may also be a utility or two hiding in the forums that can copy the EEPROM to a PC. Thats why I buy from you guys, even buying from my local microcenter and radioshack. :-) I think I've talked 3~4 people (2 I know for sure) into buying the whats a microcontroller kit. the best part, the 2am phone call "dude its so easy I programmed it an everything" :-). I wrote a couple tools last night that let you read the eeprom from the badge to a file and write an eeprom file to the badge. Due to the code storing data in the eeprom it makes it a bit hard to use the propellent tool just by itself - checksum issues and other things - but the tool I wrote just does a raw read / write from the eeprom. I also captured a virgin badge file to be able to unbrick things down the road. Looking for help with the crypto part of the challenge - working on some cool hardware hacks now. So where did the uber image go? Yea. Where did that run off to? OK - sorry for the delay. I was a bit scared to log into the parallax forums from the unsecured defcon network since they don't use https.... but a VPN to another machine is serving its purpose well. Here is what I have: Look at the README.txt file - it should go through the basics. Sorry things are not more user friendly but it gets the job done. I included the virginbadge.eeprom so you can unbrick your badge. I don't think is was meant to be published since it was blacked out in the wired article also. Jen. Shouldn't you put a smiley after that? We know you did it. Cut it out with the chain saw. Dan, you are most definitely the man. Do you know which badge version that cherry code came from? It was a human badge. That virgin image seems to be working! Now I can try to break it again with impunity! The UBER is still on the front page graphic when you enter the web site! !